Rio Olympics 2016: How should operators best target this important sport event and capture the interest of traditional and new bettors? More than 200 member nations of the International Olympic Committee (IOC) are expected to compete in the 2016 Olympic Games in Rio de Janeiro that will take place from 5th to 21st August 2016, and will be followed by the Paralympic Games from 7th to 18th September. What has changed from 2012? The London Olympics 2012 showed a strong digital interest with over 60% of traffic to the official London Olympics website having come from a mobile device. Over the last 4 years, technology has advanced significantly and in the 2016 Games, the role of mobile and social media seems to have become even stronger. 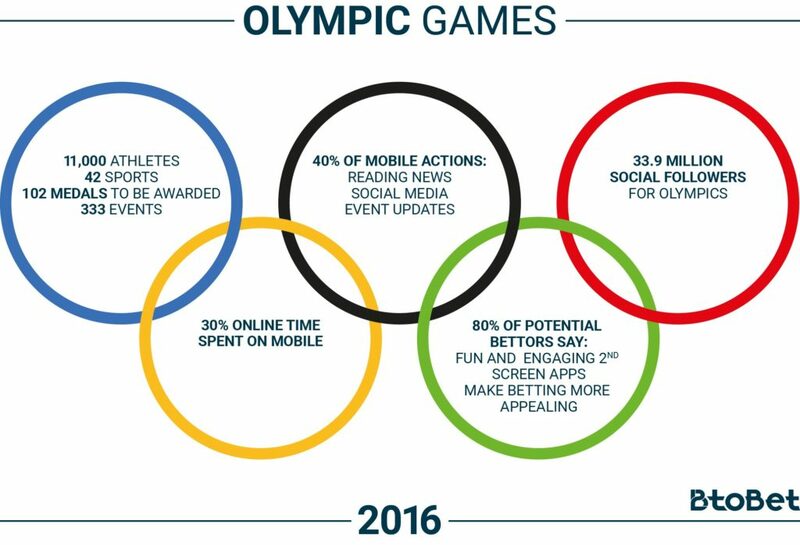 In fact, statistics indicate that 30% of online time for Olympics fans this year will be spent on a mobile device, with 40% of that time spent reading news, blogs, social networks and event updates. Moreover, studies are showing that around 80% of casual bettors could be attracted by second-screen offers, which have already started to change the nature of sportsbooks and placed mobile at the heart of live betting. With the Olympics around the corner and mobile playing a significant role in the daily lives of its fans, brands can easily take advantage of this situation, as a second-screen engagement using social media and apps holds great potential. “The Olympic Games in Rio’s mobile channels can create great opportunity of betting, fun and revenues. To attract potential bettors, young players and a new audience, a successful offer can come out of mobile apps. Betting, simple fun games, sporting games, multi-player battles, virtual reality and competitions are essential ingredients for a younger target. Betting apps that enable users to bet on anything that is related to the Olympics (how many goals will be in the soccer games altogether, what color will the winners clothes be, etc.) can be very successful for brands”.